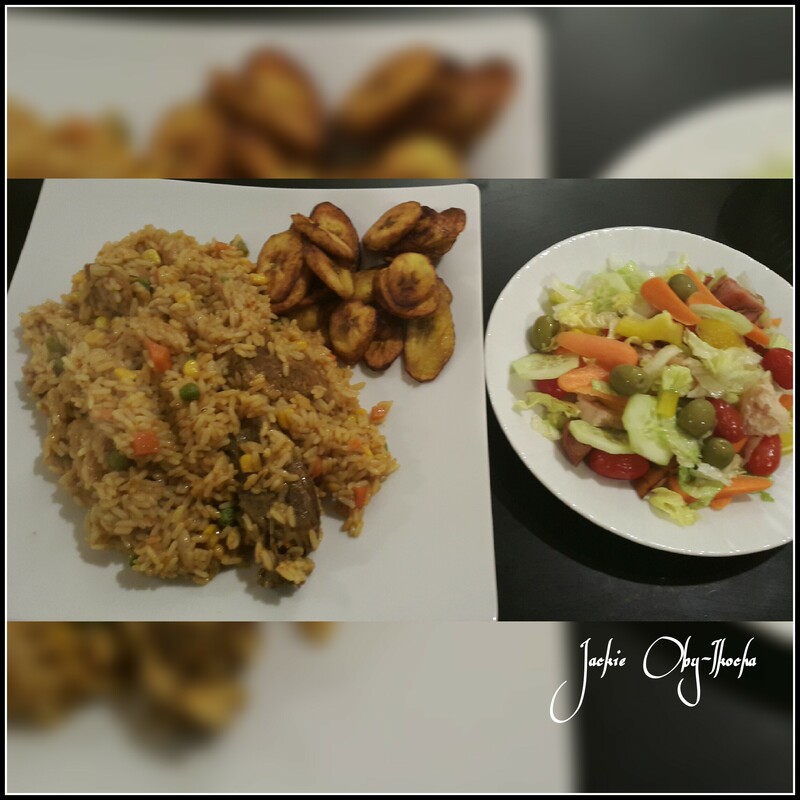 Cooking for my family – Jollof Rice with beef, fried plantain and salad. Jollof rice is a staple dish eaten in most West African homes and though I am not living in my home country, Nigeria, a lot of our native dishes feature big time on my menu each week. As a busy mum, I try to cook a large pot that will serve my family at least twice. This is time saving and grants me some respite on some evenings when I can just kick back a little and not sweat over the cooking pot. So, from my cooking pot, I bring you my own modified version of jollof rice. Modified in the sense that I added some vegetables. I always seek ways of sneaking in extra veggies for my children in as much as my younger son finds time to pick the peas, he still gets to eat a good portion. 1 kg of fresh, red tomatoes blended with red bell peppers, chilli pepper, ginger and garlic. 3 cooking spoons of vegetable oil. I use Canola oil. 3 tsp curry powder – if I find Nigerian curry powder all the better ‘cos it’s more aromatic. 450 gms of diced vegetables. 1 tin of pureed tomato paste to add more colour – optional. I prepared the tomato stew by boiling the tomatoes first to lose to lose excess water, then fry the dried blend in the vegetable oil and spice. Cook your meat with curry, garlic, thyme, salt, ground pepper, Knorr cubes and chopped onions. The cooking time depends on the type of meat and how soft you want it. You can also fry or grill the meat depending on your taste. Parboil the rice by boiling it. Rinse the parboiled rice and leave it in a colander to drain. Pour your meat stock and the tomato stew into a sizeable pot and leave it to boil. When it boils, add the parboiled rice, curry powder, salt and pepper to taste. The quantity of water should be at the same level with the rice to ensure that the rice doesn’t get too soggy by the time it’s cooked. Cover the pot and cook on low to medium heat. Jollof rice has the tendency to burn so keeping it on reduced heat helps to prevent it from burning so much before the water dries up. Normally, the rice will be done by the time the water is dry but if not, add more water in small quantities and keep cooking on reduced heat till done. When it’s cooked, you can serve with fried plantains and salad.